Daynite Towing services, established in 1953, is one of the oldest towing companies in the country. We provide a comprehensive truck, bus and vehicle towing service to the Perth and Western Australia region, and throughout Australia if required. 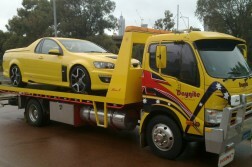 We have been towing cars, trucks and busses for more than 50 years and specialise in heavy vehicle towing, truck and coach recovery, vehicle and machinery relocations, over-dimensional loads, hot shots, boat towing, and multi-vehicle movements throughout Perth and Western Australia. We provide reliable towing and roadside services 24 hours a day, 7 days a week.